Description: The Pale Fox is a species of fox which inhabits the semiarid regions of the Sahara Desert. The Latin name Vulpes Pallida literally means "Fox Pale." Its environmental status is described as "data deficient" due to lack of intensified study of the Pale Fox in the wild. Description: The Pale Fox (Vulpes Pallida) is a species of fox which inhabits the semiarid regions of the Sahara Desert. Its environmental status is described as "data deficient" due to lack of intensified study of the Pale Fox in the wild. The Pale Fox is long-bodied with relatively short legs and a narrow muzzle. Its ears are long and rounded at the tip. Its tail is bushy and black-tipped. Its weight ranges from 4-6 pounds. The upper-part of its body has a pale sandy color, while the underpart is whitish. A dark ring surrounds the fox's eyes. The Pale Fox is poorly known, but has a life span of 10 - 12 years. Their ears are slightly smaller than the Fennec Fox, but these foxes are often mistaken for Fennecs. The one distinct feature that differentiates them from the other African foxes is their black-tipped tail, as Blanford's Fox and Cape Fox both have white-tipped tails. General: They prefer desert, thorny savannahs, steppes, and semi arid regions rather than forests or woods. The Pale Fox's diet mainly consists of rodents, insects, and plants. They can retain water and go almost entirely without drinking water by absorbing it from prey items but will drink if possible. Reproduction: After a gestation period of about 53 days, the Pale Fox gives birth of 3 - 6 kits. Each kit weighs about 2.64 ounces at birth. They are weaned onto solid foods from 6 - 8 weeks. There are five recognized subspecies of the Pale Fox. Vocalizations: According to the ones I met, they seem to be just as vocal in captivity as Fennecs, expressing loud shrieks of joy when excited. The same gekkering of Fennecs can also be heard from these similar desert foxes, and when mating in the spring, their noises are almost a constant drone. The Pale Fox is long-bodied with relatively short legs and a narrow muzzle. Its ears are long and rounded at the tip. Its tail is bushy and black-tipped. Its weight ranges from 4-6 pounds. The upper-part of its body has a pale sandy color, while the underpart is whitish. A dark ring surrounds the fox's eyes. Their body has a less dense coat than the Fennec Fox, and they have smaller ears relative to their size. Their tail is somewhat bushier however. As a Pet: Few Pale Foxes can be seen in the United States in the pet trade, having been imported here by accident. A breeder trying to import fresh Fennec Fox bloodlines accidentally imported these instead in 2012. After two years of unsuccessfully trying to breed them, he sold his 4 breeding pairs to various people throughout the United States. Sucess has been reached trying to breed them, and it is reported that they are much friendlier and tame easier than the Fennec Fox if properly socialized. They still make the loud and high pitched screech like the Fennec however. If properly socialized these foxes would make great pets for anyone who does not mind the noise, especially since they produce very little body odor, like the Fennec, Kit, Swift, and Gray Foxes. It should be noted that the only species of fox that does mark with their urine is Gray Foxes, and that these Pale Foxes are no exception. Reproduction: After a gestation period of about 53 days, the Pale Fox gives birth of 3 - 6 kits. Each kit weighs about 2.64 ounces at birth. They are weaned onto solid foods from 6 - 8 weeks. As will all foxes (except the Russian Domesticated ones), kits should be taken from the mother around 10-20 days, and hand reared for the tamest offspring possible. Kits should be socialized as much as they can with dogs, cats, and children before going to their forever homes. Any fox kits also need to be handled, have their feet, faces and mouth touched when they are kits so they are not uncomfortable with this as adults. Diet: In the wild, they would be omnivores, eating mice, plants, insects, and fruits and veggies if possible, so their diet must reflect this in captivity. Pale Foxes are new to the captive pet trade so it is unknown whether they need larger amounts of taurine than other foxes, but it is safe to assume their dietary needs are similar to Fennecs. 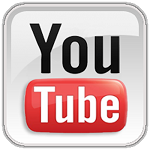 You can read more about a good diet on the 'Diet & Adopting' page. 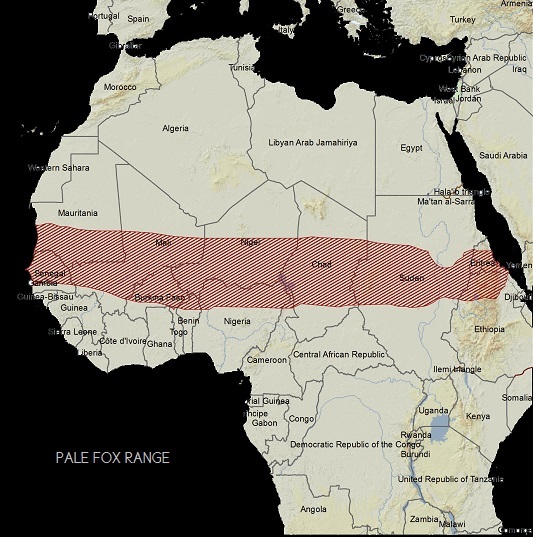 Range: The Pale Fox's range extends throughout the middle of Africa, extending north by the Sahara Desert, and overlapping the Fennec Fox's area. They generally tend to avoid other foxes, but like all foxes, like to dig and make extensive burrows underground to keep safe from predators. There are many threats to their range, including habitat loss as the primary source, and land development and predators. As humans colonize and develop more and more land, the foxes become more spread out, often not coming into contact with other foxes often enough to breed. Anatomy: Interestingly enough, Pale Foxes have grinding molars like Swift Foxes do, which show that they eat not strictly meat in the wild but plant life and possibly fruit and veggies as well. However, due to their teeth, you can see the majority of them have a more carnivorous shape, similar to felines, which would suggest they eat more meat and less vegetation than Swift Foxes in the wild. We need a wider study of these elusive foxes in the wild to be conclusive about their dietary habits. Though they have similar personalities in vocal calls and pack mentality that Fennecs do, the interesting thing is that they share similarities with body shape and structure to Swift Foxes and Kit Foxes, which live across the world from them.